Hardy Carolina Jasmine | Gurney's Seed & Nursery Co. Bright, funnel-shaped yellow flowers bloom in clusters in late spring, and may repeat in the fall. 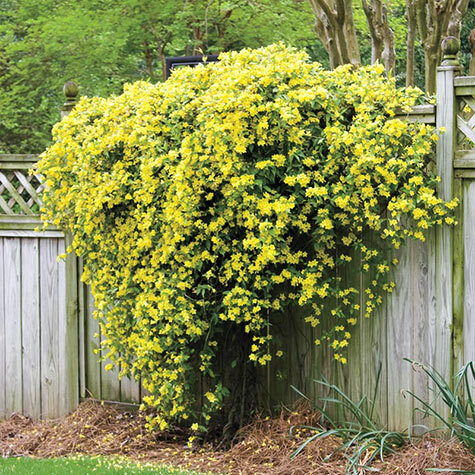 Growing 8- to 10-ft. tall, it climbs fences, arbors and trellises. Intoxicatingly sweet fragrance attracts hummingbirds and butterflies. Award winner is more cold hardy than other varieties. Full sun to partial shade. Zones 6-9. 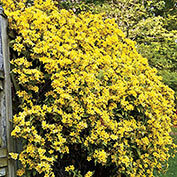 Botanical Name: Gelsemium sempervirens 'Margarita"
Depth: Best used to climb fences, arbors or trellises because it is a twining vine as opposed to a clinging vine. Light Required: Full to partial sun. 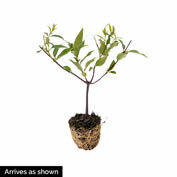 Foliage: Opposite, oblong to lanceloate, shiny green leaves. Blooms: Late Spring. May repeat in Fall if conditions are favorable. Form: Semi-evergreen to deciduous vine. Flower Form: Funnel-shaped, approximately 1 inch long in clusters along the leaf axil. Soil Requirements: Well-drained, slightly moist soil that is slightly acidic. Pruning: Trim to any desired size. Will take a hard pruning in early Spring to control growth. Comments: Enjoy a profuse display of birght golden trumpet blooms with a light sweet fragrance in Spring time. This is a vine that exhibits restrained growth so it would be easy to train or trim back for any area that needs a flowing bank of color. Acts semi-evergreen toward the South, more deciduous in the North.